If you thought Gus van Sant would be more suited to make an interesting picture about the phenomenon of the Japanese suicide forest Aokigahara than the creators of the recent bland horror movie The Forest would, you thought wrong. Say what you will about The Forest, it had no other pretentions than being an average spooky flick (except maybe for the 'average' part, but then they should have tried harder). The Sea of Trees, not so. It's a bold potpourri of supernatural thrills, Japanese versus Western belief systems, tearjerking drama and philosophical reflections on the nature of suicide. At least, it likes to be. It sadly fails in every respect, making this a prime candidate for the title of 'Worst Gus van Sant Movie'. The ingredients for a terrific movie are all there. 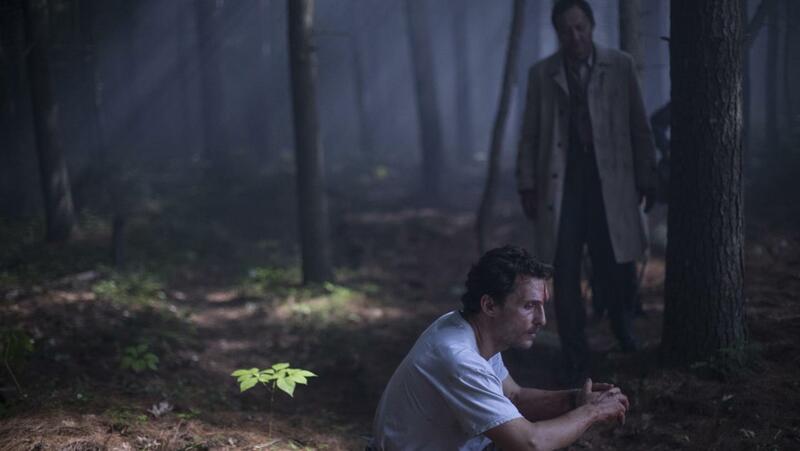 There's a haunting mystery (a forest where people voluntarily come to kill themselves), a shot at emotionally compelling drama (a husband and wife not getting along but coming together over the latter's impending demise), some damn fine actors (McConaughey, Watanabe, Watts, need I say more?) and lots of wonderful cinematography. The movie only succeeds in offering that last bit to our satisfaction. Whether it's the director or the screenwriter who couldn't be bothered with stringing it all together seamlessly into an intriguing whole is hard to tell. It's certainly not the actors, as all of them appear bored or distracted. In Watanabe's case, matters are made worse due to him apparently having been hired as Hollywood's token Japanese man for this occasion, making him rant on about Japanese superstition ad nauseam. We simply can't learn to care about either him or his American companion, who set out to kill himself but had a change of heart in his desire to help his new local friend get home alive. It's seemingly enough of a motivation after the devastating death of his wife to make him find new faith in life and forget all about his suicidal plans, but not for us to go along with his new lust for living. We simply cannot care about it all, which also stems from Van Sant's odd choice of going nigh 'full Hollywood' in his dramatic scenes set in the States. Usually he opts for what many consider a more European style, but in this scenario, studio tearjerking methods got his preference. And so we have to sit through dull and ultimately predictable flashbacks explaining the protagonist's desire to end his life, even though, illogically, he and his wife never really got along anyway. The scenes in the forest, meanwhile, offer little more captivating moments or surprising twists. Admirably shot and lit as they may be (though much of it not actually filmed in Japan, but rather Stateside) and accompanied for the most part by decently melancholy music, we still grow restless over the lack of empathy triggered at our side of things. It's not so bad that it makes us want to kill ourselves, but it's still frighteningly frustrating to come to realize that a director who often has something worthwhile to share with his audience, really has absolutely nothing noteworthy to say about a fascinating topic of conversation as the so-called Sea of Trees.